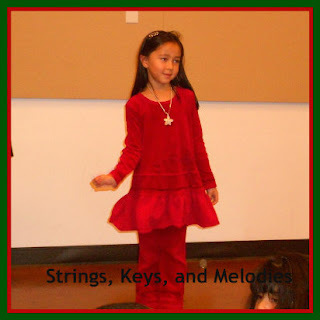 We held our Christmas Recital this past Saturday, December 1, 2012. This was the first time we held our recital at our local public library, Valley Hi -Laguna North Library. It was a large room with space for all of our families and friends. The one bad things was that it was so big it made it hard to hear our voice students without a microphone. But overall it was a nice place. Over 30 students performed holiday songs! The voice students sang throughout the recital. 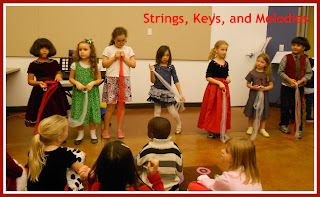 They all did a beautiful job singing fun Christmas songs such as Jingle Bells, White Christmas and Last Christmas as well as more serious songs such as O Holy Night and Silent Night. 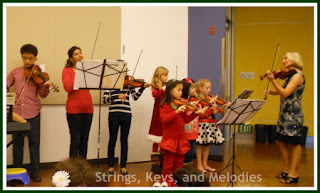 The violin students performed the Twinkles from the Suzuki books plus Christmas classics such as Jolly Old Saint Nicholas and Carol of the Bells. We are proud of our violin students. Violin students perform their holiday songs. 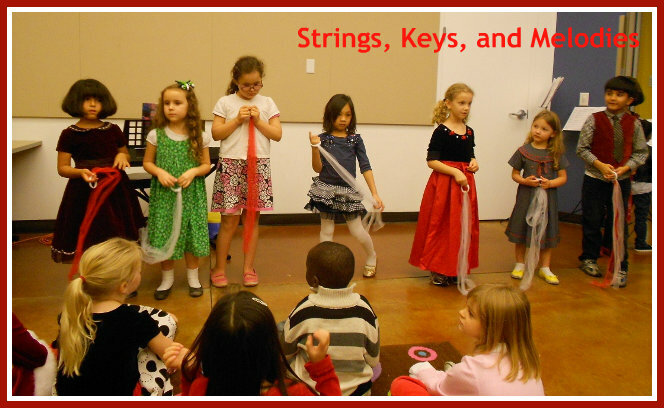 The Music and Movement classes and various piano students did a fun Ribbon Dance to the Nutcracker song, Trepak. They also sang The Twelve Days of Christmas while holding pictures for each verse. They all did a fantastic job! 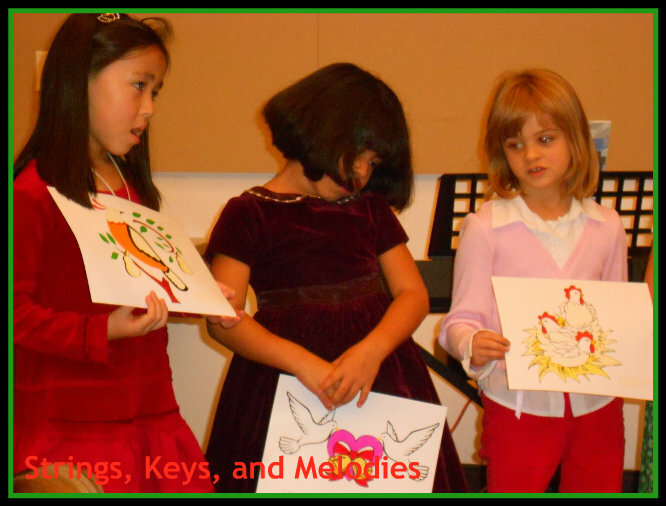 All of our piano students took turns playing the special holiday songs they have been working hard on. They each did a great job! 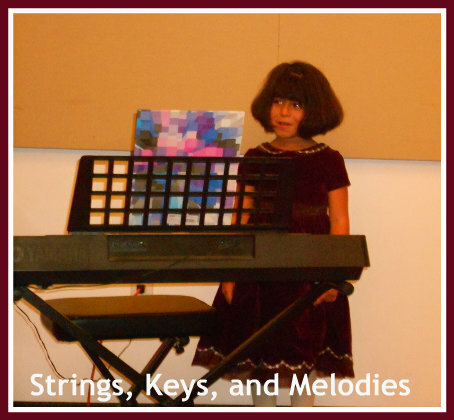 One very cute piano student introducing herself. 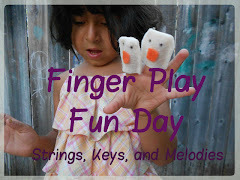 I enjoy seeing the children perform after working so hard on their songs. Many of them overcame their fears of being in front of an audience. Each recital they go a bit further and do better. I am so proud of all our students. Overcoming a nervous tummy ache! We made a movie of the recital but it is much too long to upload to YouTube! 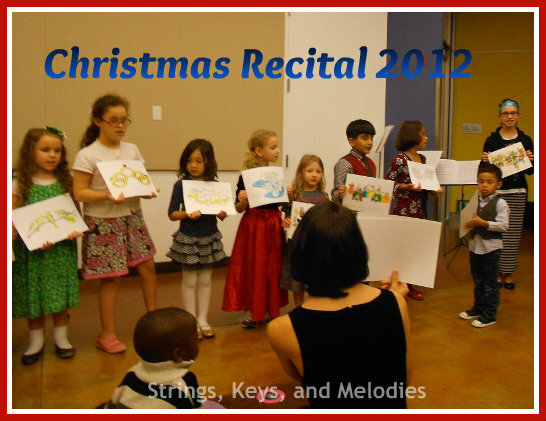 DVD's of the recital are available for $5. Just let me know! What a great way to kick off the Christmas Season!!! 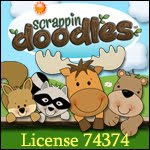 Lovely, lovely children and photos and songs! Thank you so much for sharing this wonderful event. So nice! Thank you for reading Carolyn!